American Ordinance, a subsidiary of Day & Zimmerman, manufactures ammunition for the U.S. military at locations in Tennessee and Iowa. As it ships ammunition to U.S. military installations, it is critical to be able to monitor each shipment in transit. Specialized forms need to accompany each shipment, but their traditional carbon paper forms were becoming cumbersome and costly. 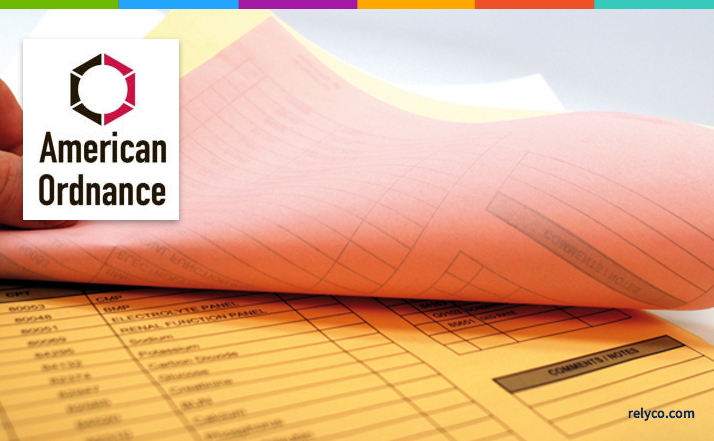 Here’s how our carbonless forms helped streamline operations and save the company money. The company produces four copies of the form for each shipment, including the packing slip and bill of lading which details the enclosed merchandize and gives title of that shipment to a specified party. One copy stays at the plant, and the others need to be signed as the shipment reaches each installation. As shipping manager Brad Vance explains, specialized forms accompany each shipment. American Ordinance needed a way to reduce costs and streamline it processes. Our cost-effective carbonless forms solution led American Ordinance to Relyco. Since instituting the use of REIMAGE carbonless laser paper, American Ordinance not only has seen the benefits of using a carbonless solution, but has realized significant savings in costs and time. The ease of use of the product has been a key factor in assuring a smooth flow of shipping documents from the manufacturing facility to its final destination. Read the full case study here. Carbonless laser forms are a cost effective and versatile solution. They will run on every machine, including laser, offset press, high-speed copiers and digital duplicators. And a huge benefit over pre-printed forms is that if you change an address, a phone number or conditions, you don’t have to toss the unused portion of your forms. You simply print your own carbonless forms with the most pertinent information and you will always have updated information; no reprinting necessary. For more information on carbonless forms, please call and talk to an experienced representative who will answer all of your questions, or click below to request a quick phone consultation.